Buying local takes on a whole new meaning at Brick Street Farms, St. Petersburg’s cool, new eco-friendly farm where exotic greens like Salanova escarole, Spretnak Bibb, purple kale, and tatsoi grow in an unusual, sheltered environment – shipping containers. Like most transplanted northerners who come to Florida hoping to grow Big Boy tomatoes, green beans, and lettuce in the backyard, Shannon O’Malley was quickly frustrated at her lack of success. St. Petersburg might be proud of its reputation as the Sunshine City, but when it comes to growing produce, the sun, the heat, the humidity, and the sandy soil can be a bit too much. Unlike most of us, Shannon didn’t let that stop her. 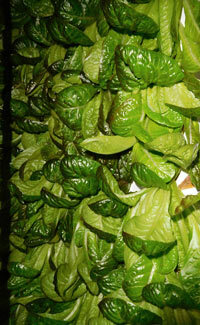 Instead, she began researching hydroponics and indoor gardening. After a little experimenting with a small hydroponic vertical-growing tower for the backyard, she decided to take an enormous leap of faith. 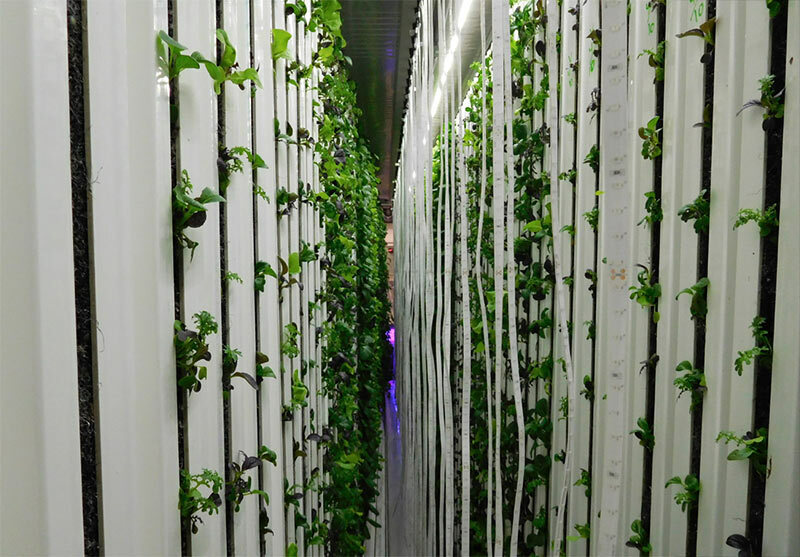 Earlier this year, Shannon and her husband, Brad Doyle, launched Brick Street Farms, a small startup company that grows plants hydroponically in eight-foot-tall vertical climbing towers. 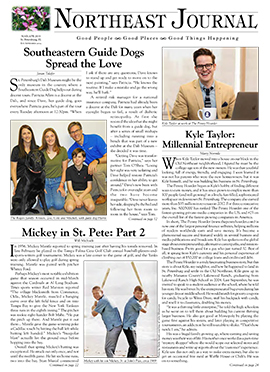 At the end of March, Brick Street Farms held its official grand opening with Mayor Rick Kriseman and St. Petersburg Area Chamber of Commerce President Chris Steinocher present to the cut the ribbon. Since then, Shannon and Brad have generated a lot of attention with their unique approach to farming. Brick Street Farms is definitely the only urban farm of its kind in Tampa Bay, and possibly the only one in the Southeast. Their plants don’t grow in soil, they’re fed liquid fertilizer automatically on a schedule. The plants also don’t have to worry about wilting in the sunshine. 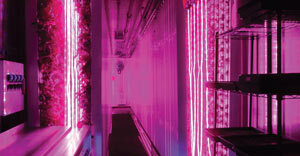 That’s because they’re grown inside huge air-conditioned shipping containers which have been transformed into high-tech mini plant laboratories. Driving by Brick Street Farms, no one would guess that inside is a very productive plant factory, or lettuce farm as Shannon describes it. That’s because the farm is situated two blocks south of downtown on the edge of the Warehouse Arts District. If you’ve ever been to the city’s Second Saturday Art Walk, chances are you’ve taken the trolley to this eclectic district, which is filled with a half-dozen small shops like T2theS, which builds custom, high-end furniture, and amazing art studios like Duncan McClellan’s Glass Shop. This is not exactly where you would picture a farm. But then, this is definitely not your typical farm. A tall, decorative wood fence encircles the entire 1/3-acre of property. You enter through a combination office, kitchen, and entertainment center that also doubles as the couple’s office. Step outside into the backyard and there in the corner are three enormous shipping containers painted bright, lime green. While I was there for a visit, a door to one of the containers opened and out stepped one of Brick Street Farm’s newest team members. While we were sweating and the local temperatures were hovering in the mid-80s, the employee was bundled up in a winter jacket and cap. “It’s 63 degrees in there, the perfect temperature for the plants,” says Brad. Shannon refers to each container as its own self-contained farm. Each has its own air-conditioning unit, propane tank for giving the plants a steady dose of CO2, and fans for adding a lightly blowing wind to keep the air moving. 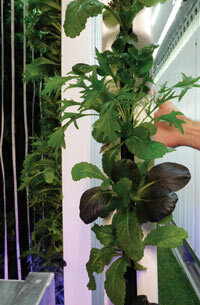 Vertical metal towers on each side of the container are where the plants grow. Each tower has its own strip of red and blue LED lights – these are the only colors in the spectrum that plants use, says Shannon. Standing inside looking at the operation, it feels a little like a sci-fi movie as the red and blue lights together cast a slightly eerie pink glow. “This is a very high-oxygen environment,” says Shannon. It’s also a very high-tech environment. Everything is controlled via an app on Shannon’s smartphone or laptop. It’s a creative, out-of-the-box idea – but not too surprising, given the couple’s background in engineering and software technology. Brad is a software engineering specialist at Duke Energy and Shannon was a senior project manager there until a few months ago when Brick Street Farms began to take off and she needed to devote more time to the growing business. The couple’s focus is primarily commercial, but they do sell to the public whatever remaining produce is available each week while supplies last. You can sign up online for an email blast alerting you to the week’s offering, which recently included items like Toscano kale, wild arugula, purple opal basil and green basil mix and raw wildflower honey from local beekeeper John Morse. Local restaurants like Marchand’s Bar & Grill at the Renaissance Vinoy, Bella Brava’s, Rococo Steak House, and Stillwater’s Tavern are just a few of their regular clients. So far, the Vinoy is their biggest fan. There’s even a Brick Street Farms Salad on the menu with red mustard greens, pac choi, and heirloom skypos butterhead orange lettuce. Many area chefs are also partnering with the couple to offer outdoor ‘pop-up’ dinners inside the farm property. A big tent, tables, and twinkling lights add a little glamour. Shannon calls St. Petersburg a ‘food desert,’ a USDA description that refers to a lack of fresh, healthy, locally grown produce. She and Brad hope to change that. “We’re filling a demand,” says Shannon. So far, they’re growing about 10 varieties of heirloom lettuces and other greens from non-GMO seeds that they purchase from specialty growers like Johnny’s Selected Seeds and Baker Creek Heirloom Seeds. More recently, they’ve added microgreens, the tiny immature greens that are harvested when they’re about two-inches tall and extremely flavorful. 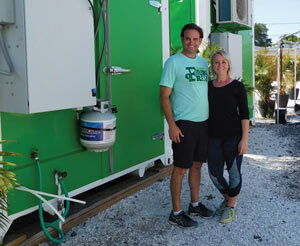 Besides their unique produce, Shannon and Brad are committed to green, sustainable living. “We use no chemicals and there is no run-off… in fact, nothing detrimental at all to the land or the city,” says Shannon. “We use less than 10 gallons of water per day per container and recycle all of it. Our energy usage is about one-tenth of the usage of a traditional farm with our yield.” Their yield is sizeable. They can grow two acres of produce per month per container, and year-round since there are no growing seasons to worry about. The couple has big plans for the future. They hope to add more containers for growing an expanded crop of produce, a permanent covered event space for private parties, and even a chef’s kitchen, to be designed from a converted shipping container. Above the event space would be an apartment, which would become their permanent residence. They currently live in Crescent Heights, but like the idea of urban living in the heart of downtown.